Most businesses are aware that consumer feedback is highly vital in order to increase its brand credibility. The e-commerce sector is not spared from this as well but in fact is at the forefront in today’s internet savvy era. Consumers can easily vent out their dissatisfactions today through social media channels and other outlets where bad news can reach a large number of audiences in a matter of seconds. Hence, it is important for e-commerce businesses to discern the current issues and listen to consumers’ needs. Also noting that e-commerce is considerably still a new industry in the market, many consumers have yet to entrust their Ringgits to a store in the cloud to meet their needs. Bain & Company conducted a research and highlighted that consumers in Southeast Asia (SEA) don’t fully trust e-commerce platforms and that these complaints are typical in the early stages at less developed e-commerce sectors. As such, we partnered with Trusted Company, a third-party platform for consumer reviews and conducted a study to analyse 30,000 reviews and complaints by Singaporeans, Malaysians, Thais, and Filipinos. We found some really interesting insights on the way consumers made complaints as well as the differences between consumers in Malaysia and across different countries. 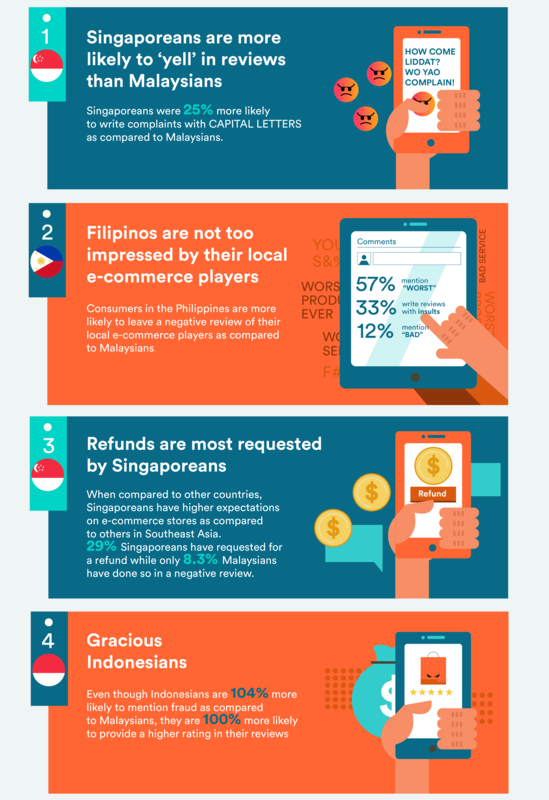 Overall, it was encouraging to find out that Malaysia’s online consumers were more satisfied with e-commerce when compared to Singaporeans and Filipinos. Nevertheless, there is much we can learn from Indonesian e-commerce businesses. Their success in maintaining consumers’ satisfaction at a high level is even more significant bearing in mind that logistics is its biggest hurdle due to its vast size and inhabitants across thousands of islands across the country. Our study also revealed that there is no one-size-fits-all consumer relationship formula we can replicate across multiple countries. This is especially relevant for business who operates in multiple countries and an important aspect to be considered for businesses looking to expand outside Malaysia. More importantly, our study did not focus on specific industries in e-commerce such as online shopping, food deliveries and many others which might reveal more interesting insights on consumer’s current pet peeves about making purchases online. As such, it is e-commerce businesses’ responsibility to reach out to their customers and find out how they can improve to serve them better.